Having a low opinion of yourself is not ‘modesty,’ it’s self-destruction. Holding your uniqueness in high regard is not ‘egotism,’ it’s a necessary precondition to happiness and success. Isn’t that the truth. There’s nothing sadder than a child who already has learned to say, “I’m dumb”, or “I’m not as pretty as the other girls”. I recently signed up to be a reading tutor in our school system. It’s only an hour a week, but reading throughout the school year with a little one who might not have the experience at home, and helping them improve their reading skills, is one good way to help them move beyond that learned self-denigration. 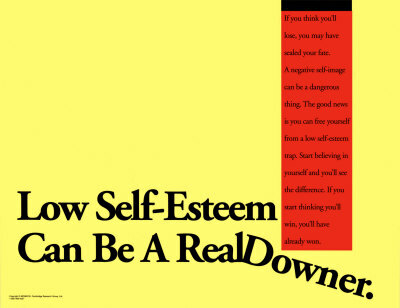 Someone in our educational system told me that there are a lot of kids who have low self-esteem. But the sad thing is that it’s not only kids, but a lot of adults whose sense of self-worth is damaged.